It’s funny how trades come in waves. I already showed off a run of sticker trades that came in quick succession. Today, I have two trades for my Garbage Pail Kids collections. These are tough to trade for on a primarily baseball blog. There’s not as much cross-pollination as I might hope. I really should try a message board or something one of these days, but I’m sure it will just be a thing I think about doing and never actually do (you know, like most of life). Anyway, through the magic of twitter, I found my first of two featured trade partners in Colbey (flywheels). You all know him from previous trades, affordable group breaks and his blog Cardboard Collections. We swapped a handful of the horror themed set that was released late last year, and here’s a sampling. 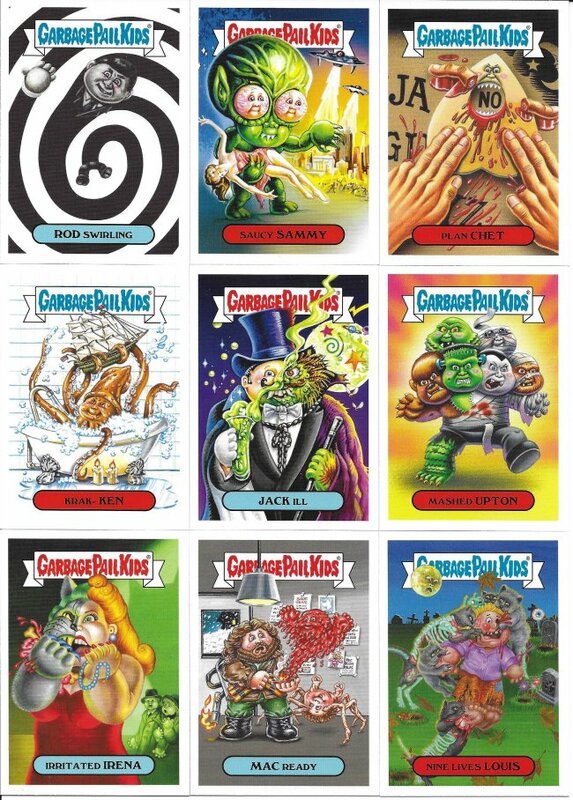 The themes have been a good idea for the newer GPK stuff and I like that they can get deep into the pop culture of the topic that way. My childhood paranoia kept me away from horror stuff for decades, but I’m slowly getting acquainted with some of the stuff I missed. I also used to work at a video store (back when those were a thing) so I at least know the references from the VHS and DVD boxes. 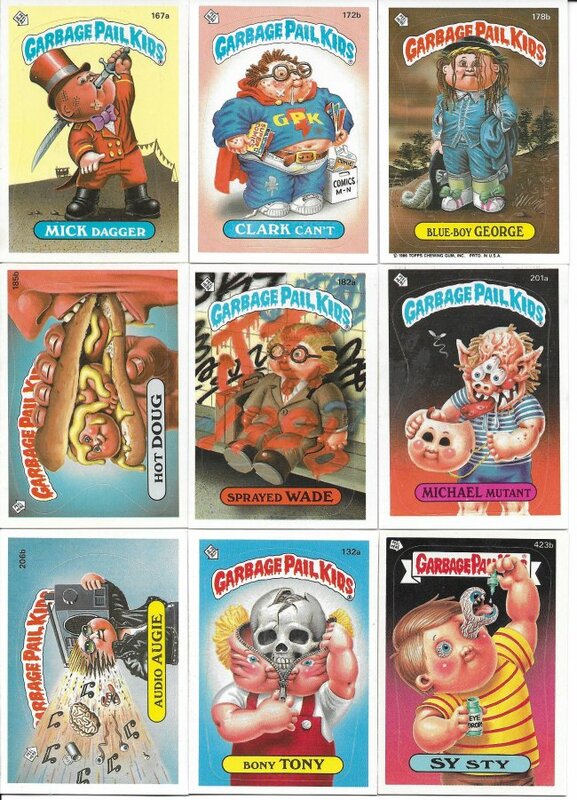 Of course, spoofing pop culture has always been the goal of the Garbage Pail Kids as we see with this great trade package from Johnny’s Trading Spot. I don’t have any of these original run cards on my want list page. I know I have a bunch back in my parents house that I need to find and sift through. Also, the aforementioned difficulty in trading for GPK in general makes it a low priority. But I’ll be damned if I’m going to say no to accepting a healthy stack in a trade if it’s offered to me. Johnny sent me a bunch and I just picked a few of the classic highlights. Some of them even had back variants. Having the same front, but different backs is not something I knew was a possibility back then. The backs of these are sometimes better than the fronts. Puzzle backs, comics, silly games, profiles, etc. Just awesome and something that’s sorely missing from the newer releases. Now they don’t do anything other than a color coded background with subsets. I miss this extra care. But, I appreciate the care packages from Colbey and Johnny very much. 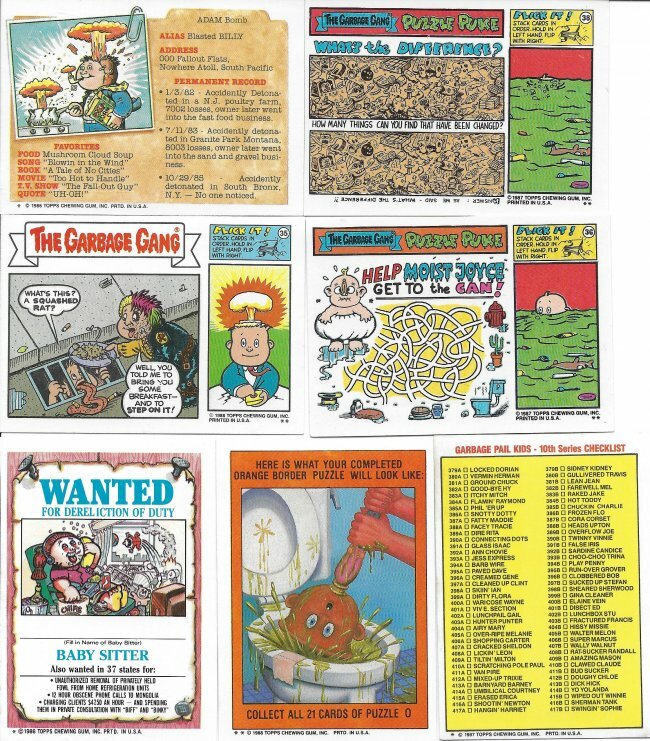 If anyone else wants to join the bandwagon, hop on over to my want/trade list for all the 2010-present GPK sets and you too can have a trade featured on this blog months later. 2 comments to What Garbage (Pail Kids) Trades! I love GPK posts! I don’t really purchase any of the new stuff… but I did purchase a big 80’s collection a few years ago at a card show . There was a brief period when I was actually going wild and trying to track down all of the variations from the 2nd to 10th series. I’ve kinda pushed that project off to the side though. Maybe one day I’ll hop back on it though. Oh man, if you ever do, let me know. One of these days I’ll transport my classic stuff from my parents’ to my house and get things sorted. I’m sure I could help with that project if you pick it up. And if you do buy any of the new stuff, I’m your guy for run-off!